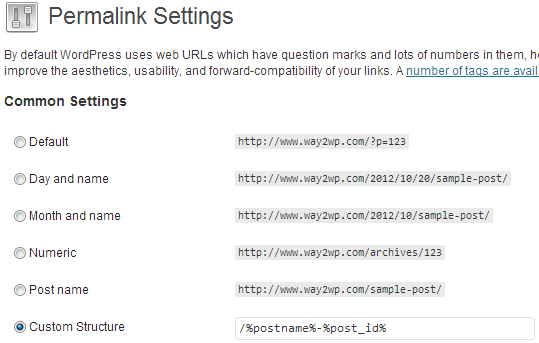 In WordPress, permalinks are permanent links to your posts, pages, category archives etc. These are the links that you would give to someone if you want to refer them to your post or a page. These permalinks will be used if someone decides to share your posts on social media channels like Facebook and Twitter. This permalink structure, that actually defines the content of the post or page, is called pretty permalink. Its very important to change your permalink structure in WordPress from default to pretty permalinks for better WordPress SEO. Its very easy to change the permalink structure in WordPress if you have a linux based WordPress web hosting with mod_rewrite installed. Just go to Settings > Permalinks, and set the value of ‘custom structure’ to %postname%-%post_id%. Note: mod_rewrite is installed by default on most linux hosting. But its still better to ask your web host if it would play nice with WordPress if you are going to purchase a new web hosting plan to start a WordPress based website. You can also check the recommendations by me for best WordPress web hosting. That’s it. You should now have pretty permalinks on WordPress. If you are not on a linux based web server or if you don’t have mod_rewrite module installed on your web server, then it will be relatively diffcult to set custom pretty permalinks in WordPress. Refer to this WordPress Permalinks guide for details in this case or hire a WordPress developer to fix it.